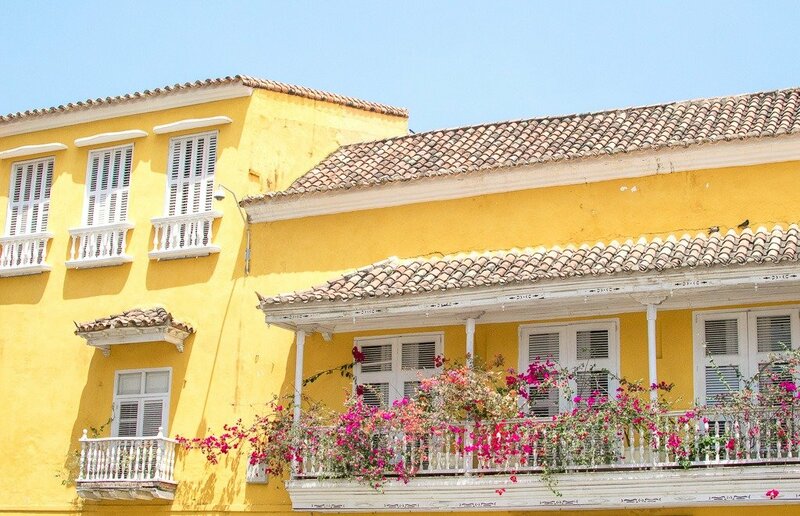 I’ve only been back from Cartagena for a few days and I’m already missing the colorful buildings, the balconies that overflow with flowers, and the amazing seafood that I ate while I was there. 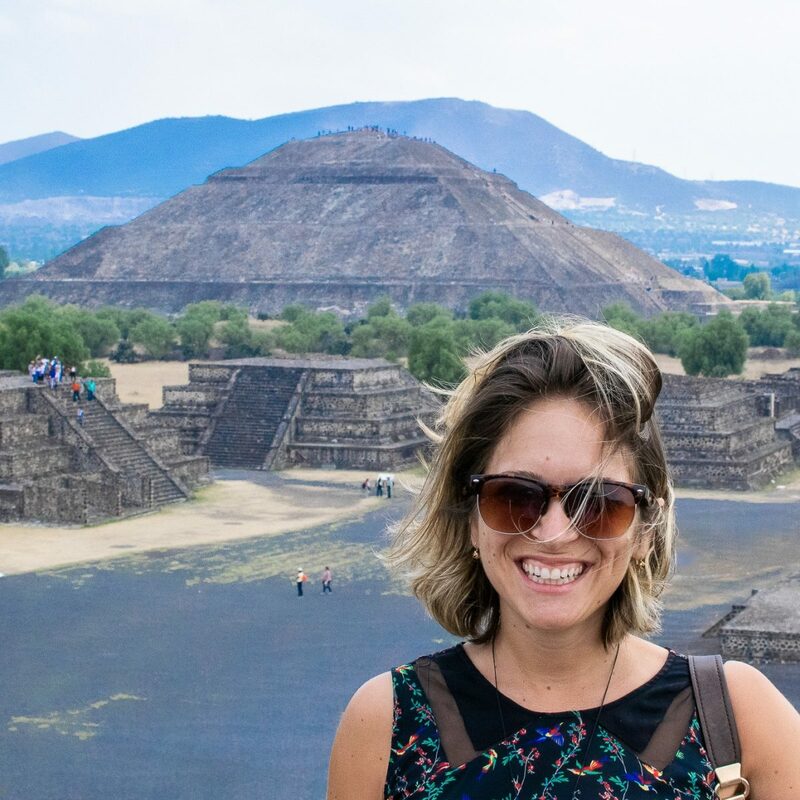 Cartagena was my first foray into Colombia, and in fact, my first trip to South America and it did not disappoint. 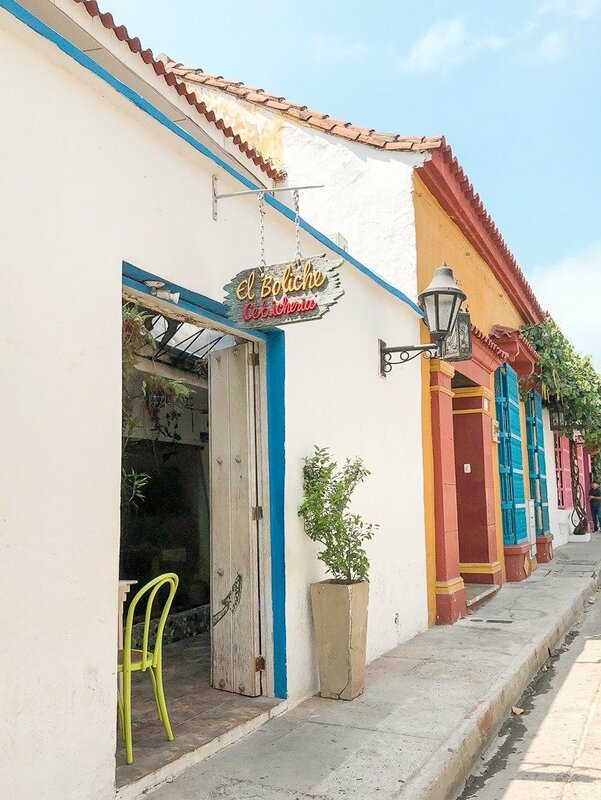 These are the best restaurants in Cartagena that I tried and a few that are on my list for my next trip to this amazing Caribbean city (because there will definitely be a next time). 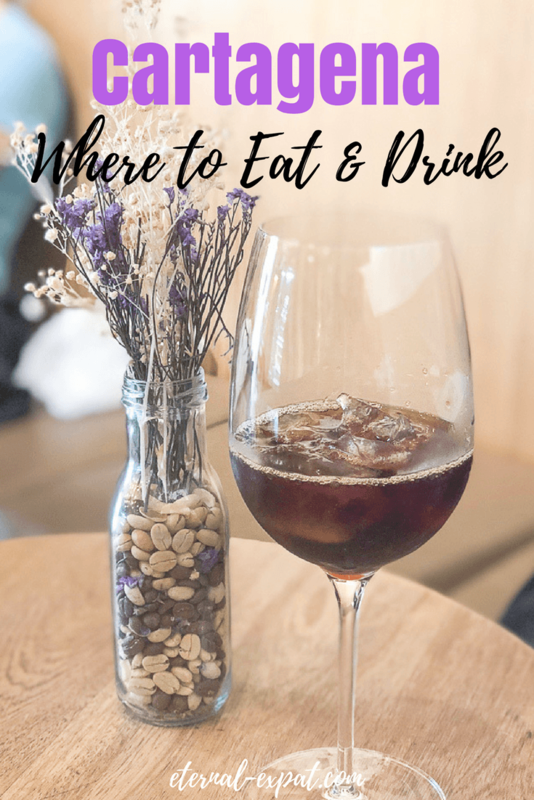 It’s also a list of a few of the best bars in Cartagena that we tried and a few general Colombia travel tips. I was pleasantly surprised to find tons of great craft beer around the city from around Colombia. Something to note if you’ve never been to Cartagena or other parts of Latin America before – the service is slow. Some places aren’t even that busy and the service is slow. Even though I experience this a ton living in Mexico, it was a totally different level in Cartagena. Even restaurants with reputations for high-quality had very slow service. You have to be patient and remember, you’re on vacation! I definitely had to remind myself a few times that I had nowhere to be and that I would simply have to wait. This was one of my favorite places that we ate during our trip to Cartagena. It’s all about the seafood here, so if you don’t like seafood, well most of the places on this list probably won’t take your fancy. The restaurant is tiny with only five or six tables and it’s a popular spot, so many sure you either make a reservation (show up the day before and give your name) or you do as we did and show up at 7pm on the dot when they open for dinner. My friend and I shared a few of the different plates with the octopus ceviche being the standout. I’ve never had octopus that was so tender and flavorful. 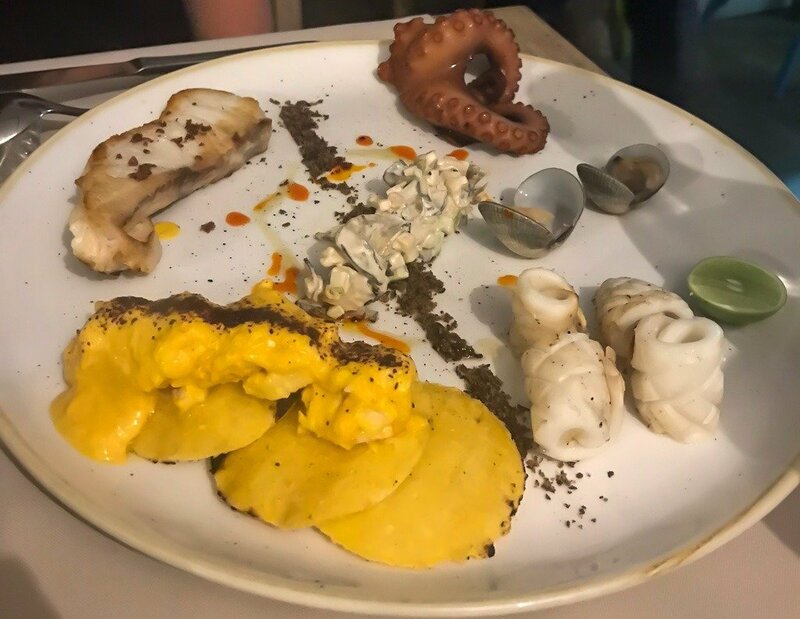 We also had a platter that has a little bit of everything – shrimp with arepas (the best part for sure), grilled fish, squid, and octopus. The entrance of El Boliche on a cute little side street. This is the platter of seafood and it was spectacular. Especially those delectable little arepas. For awesome empanadas, head to this little hole-in-the-wall spot on the edge of the Getsemani neighborhood. It was really close to the hotel we were staying at and we headed there for a few empanadas which were all amazing. The beef was well flavored, the chicken had a little spice to it, and the cheese was melty and salty and cheesy as it should be. Be sure to have it with their salsa and a touch of cream. Perhaps the most talked about restaurant in Cartagena, we almost didn’t go because I was put off by all the hype. It was made famous thanks to Anthony Bourdain. He went here on one of his shows and now it’s the sort of place that you wait an hour just to squeeze inside to one of their tables. In the end, I was really glad we tried it. 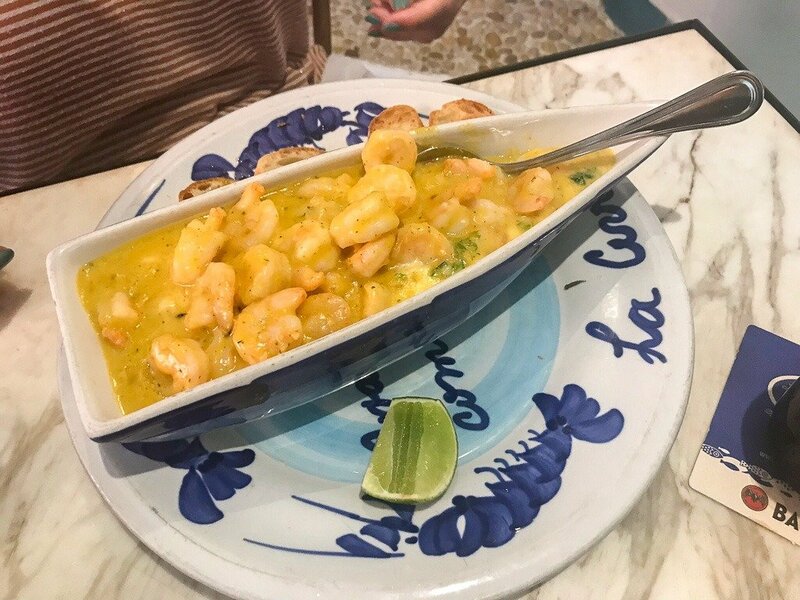 One of the dishes we had was probably the best thing I ate during the whole trip to Cartagena: the hot shrimp ceviche. It was seriously outstanding. We went for a late lunch – around 2:30 or 3pm and we got a table right away. If you don’t want to wait, I recommend coming during the mid afternoon. 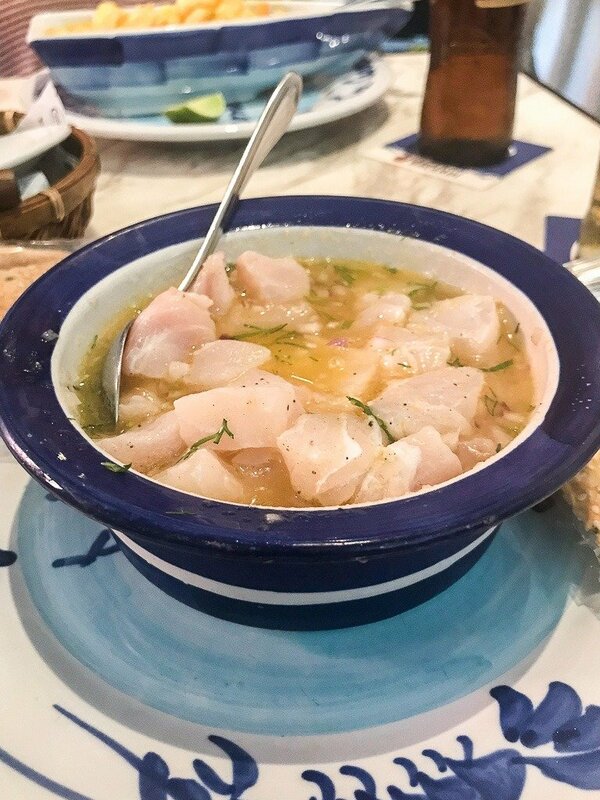 We also ordered the regular fish ceviche which was nice – it’s made with lime and orange juices which was something that I’ve never had before in a ceviche, but compared to the hot shrimp it was just ok. We also had a nice lobster curry which I also loved. Sample a few different things, pretty much everything looked and smelled delicious. This is the hot shrimp ceviche. I still dream about this amazing dish. The ceviche with orange and lime juice was really fresh and flavorful. This was one of my favorite spots for both drinks and food. We ended up coming here twice on our trip because the ambiance was so great and the tapas menu was top class. Everything we ordered from the crab dumplings to the ceviche with chicharron to the pizza was well cooked, packed with flavor, and well presented. This is also where we received the best service of all of the places we tried. While the front area of the restaurant is nice, I recommend asking if you can sit outside. The back of the restaurant is totally uncovered and had a little bit more noise and activity going on. It’s also where the kitchen is, so you get your food and drinks very quickly. They had Colombian craft beer on tap and you could easily just come here to drink if you want, but you’d be seriously missing out if you skipped out on the food here. If you’re a coffee lover, you’ll no doubt want to find some places to sample Colombian coffee. 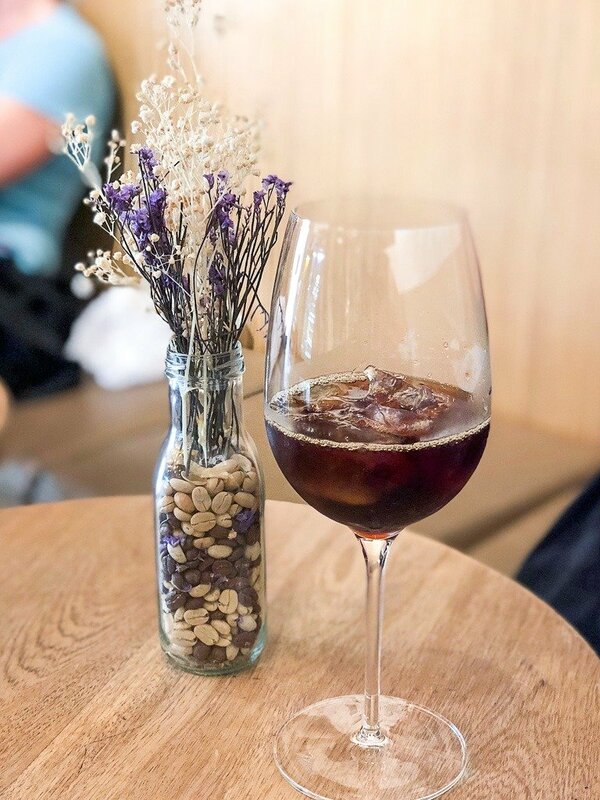 This place had a ton of great reviews and so on a hot afternoon we headed here for a delicious cold brew iced coffee. It was served in a fancy wine glass and tasted excellent. The only thing I found to be a bit of a bummer was that none of the places I visited had milk alternatives. I drank my coffee black during my entire trip to Cartagena since I don’t drink regular milk and while I do enjoy black coffee, it’s good to know in case you don’t. We asked the guy at our hotel’s front desk where he recommended we try Colombian-style arepas and he told us these were the best in the city. We ordered a few different ones – the beef was by far my favorite. It was tender, pulled apart like butter, and was packed with flavor. It was served with cheese and there were tons of different sauces to try it with. You can either sit in the restaurant or take the arepas to go, but I recommend sitting in so you can enjoy all of the delicious sauces and wash it all down with an ice cold Aguila. 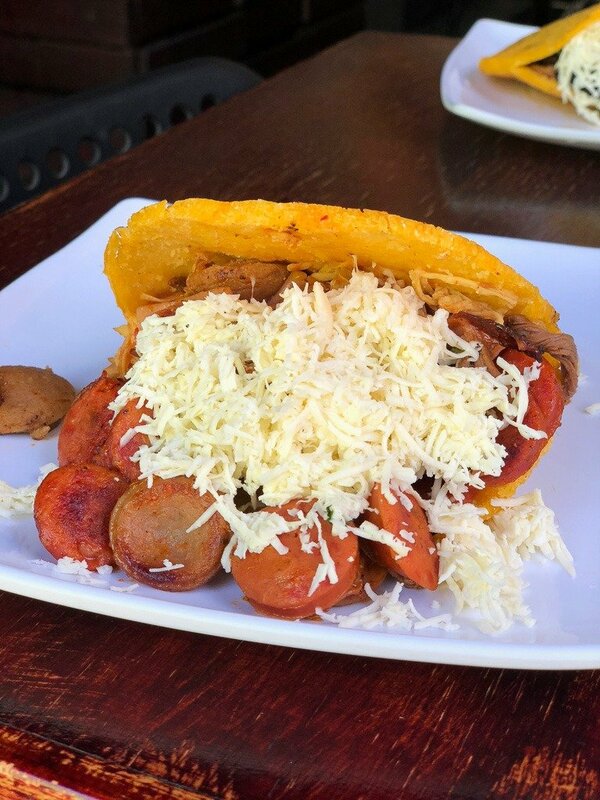 This arepa had sausage, cheese, and chicken inside along with that huge handful of cheese! I stumbled upon this little craft beer bar totally by accident, but I’m so glad we did. They have a huge selection of Colombian craft beers on draft as well as by the bottle. We sampled a few from around the country and also sampled their nachos (on Tuesdays they do a great deal: a plate of nachos and four beers for $10). 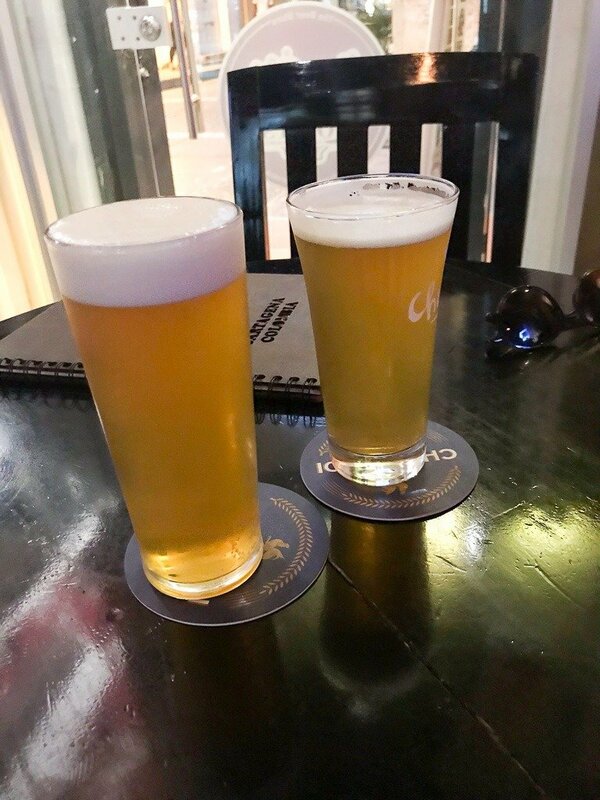 It wasn’t very busy when we went, so I wouldn’t recommend this place if you’re looking for a fun ambiance, but if you enjoy craft beer and you want to find a place that has a wide selection of Colombian options, this is the place to head. Some craft beers from Craft Beer Lovers! This is a cool little bar in Getsemani that strangely serves their beers alongside sushi. We didn’t actually go here because we wanted to eat as well as drink, but it was really busy and had live music even on a Wednesday night. 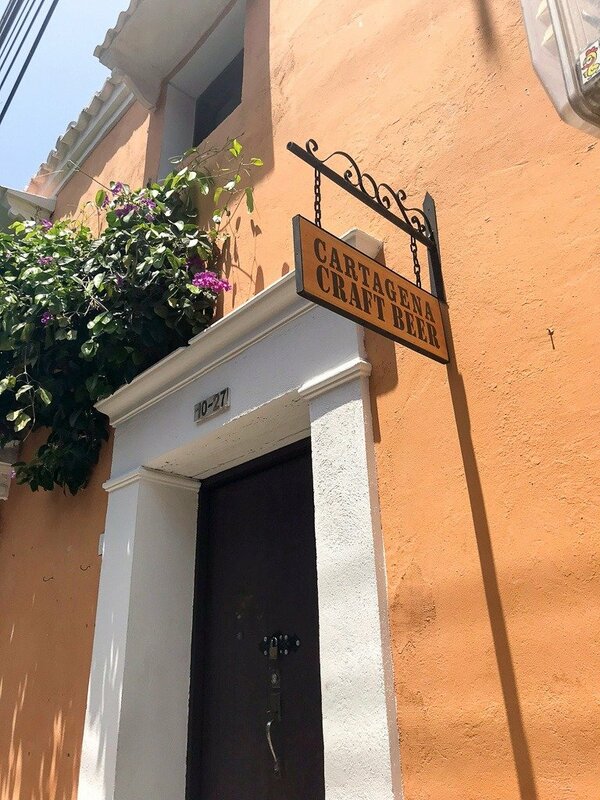 It’s one of the only places I saw in Cartagena that are actually brewing their own beer, so I’ll definitely be checking this spot out on my next trip to the city.